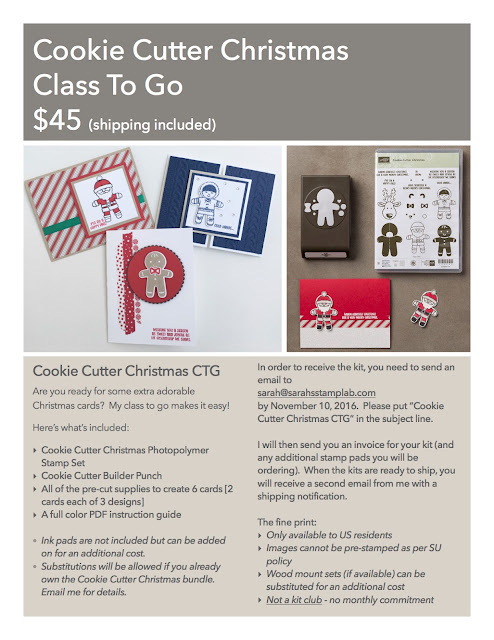 Sarah's Stamp Lab: November Class to Go! Today I'm beginning a new class series - my Classes To Go. These kit classes will be offered on a monthly basis, however there is no monthly commitment. Just order the kits that you want. It's a great way to build your stamp collection and make a few cards. See the flyer below for what's included in the kit. If interested in ordering this kit, send me an email by November 10th, 2016. Additional supplies needed to complete the cards: Crumb Cake, Night of Navy, and Black Archival Stampin' Pads, Real Red Stampin' Write Marker (currently available in a duo pack with a Crumb Cake marker), clear blocks, and Snail or Fast Fuse Adhesive.